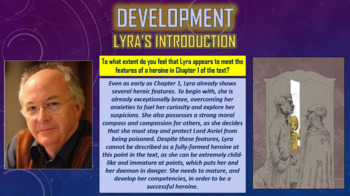 Northern Lights (The Golden Compass) - Lyra's Developing Character! 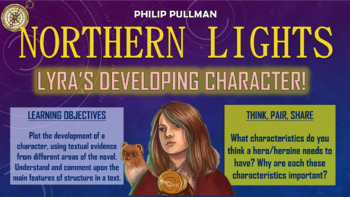 This engaging and informative lesson enables students to understand how the lead protagonist of Philip Pullmans’s Northern Lights, Lyra, develops as a character and as a heroine throughout the narrative. 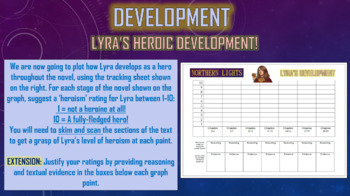 In doing so, students learn the key features of heroes and heroines, and apply these to the different behaviours that Lyra exhibits over the course of the novel. 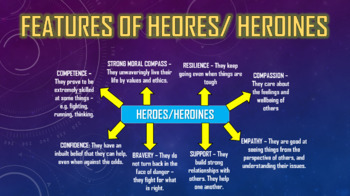 They then go on to design their own hero/heroine development storyboards! Self assessing their learning attempts.